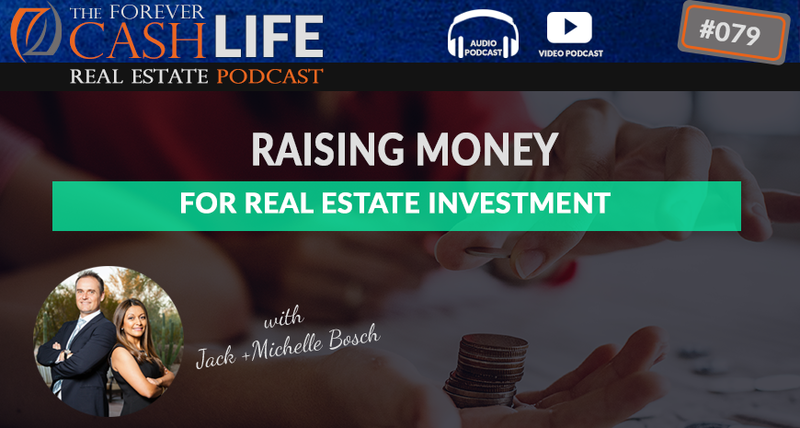 Jack Bosch unpacks the principles behind raising money for real estate investments, discussing the different ways you can go about doing this. You’ll find out how what to have in place in order to investors on board as well as alternatives if this doesn’t work out. Beyond that, you’ll discover how to become an entrepreneur that investors want to invest in. All this and more in this week’s episode of The Forever Cash Podcast! Jack: Hey there, Jack Bosch here, again with another episode of “The Forever Cash Life Real Estate” podcast. Today we’re going to talk about a little bit of a different subject. Typically as land flippers, we don’t need to raise money, but more and more, our students are doing high-end deals where they buy something for $200,000 or pull in a contract for $200,000, and sell it for $265,000. Where they put something under contract for $50, and sell it for $150 etc., etc. So sometimes it exceeds their ability to dip into their own cash or to their lines of credits, or whatever it is, so they need…they’re starting to ask, our students are starting to ask, “Well, Jack, for these higher end deals, how do I get the money?” So let’s talk about some options on how you get the money, including raising private money, including using transactional funding, and using a short-term money lender for those kind of deals. All right. Let’s go. Man: Welcome to “The Forever Cash Life Real Estate Investing” podcast with your host, Jack and Michelle Bosch. Together, let’s uncover the secrets to building true wealth through real estate, and living a purpose-driven life. Jack: All right. So in this module we’re going to talk about…not this module, in this episode of “The Forever Cash Life Real Estate” podcast, we’re going to talk about how to raise private money, how to get lenders interested in what you have to offer, and how to find also transactional funders. All right, so first of all, when you…We’re going to focus on the land business right now, because, obviously, it’s my pet peeve. We have done over 4000 deals, but you can obviously apply that to multi-family too, you can apply that to houses and so on. Typically, in our typical land deal, you do not need a million dollars. What you need…what you might need is, you might need $10,000 or $20,000 from somebody, and you might need $50,000 from somebody and so on. So the key to raising money from investors is actually a little bit different than what you thought it may be. And the key to raising money from investors is not the return. Most sophisticated investors, their number one concern is asset preservation. So in other words, they want to make sure, how likely is it that they get their money back, even if it’s with zero interest. All right? Or how unlikely or likely is it that they lose their money? They’re much more focused on that. Most investors out there, most people out there, they’re gonna go to their neighbors and like, “Hey, I can offer you 15% on your money or 25% of the money or something.” And a sophisticated investor who is willing to give you money is not excited by that. They might be excited by that if other parameters are first in place, but this is not the first parameter they’re excited about, because 15%, 25% to them first means like, “Okay, what’s the risk?” So let’s focus on that first. In order to raise money, you therefore have to give a proposition that gives the investor extremely high confidence that they will get their money back. Right? That their money is not at risk. So, for example, you wanna raise money for a medical equipment company, let’s say. Right? Something completely different. Medical equipment company. So, and you have, as actually it’s happening, and I know somebody who does that right now. So when you go to people to like, “I’m gonna offer you 12% interest on a loan.” Well, what is the loan backed by? Right? What is the collateral for that loan? If the collateral is just a startup company with no assets, well then, good luck. Then they’re gonna look at you next. And it’s just like, “Okay.” Because now they’re no longer investing into the company, they’re investing in you, then it’s like, “Okay, are you trustworthy in debt?” Which comes to the subject of, actually, “What is your reputation?” There are certain people in this world that they could offer me 300% return, backed by a personal guarantee, and I would not give them a dime. And that is because I don’t trust them as human beings. I don’t trust them as people that are of integrity. Right? I don’t think they are people of integrity. So they are that. So therefore, I won’t do business with them, period. So the first thing that you gotta do if you want to raise money, you gotta be a person that other people are willing to lend money. And I know that sounds stupid, because, “Jack, just give me the quick technique. What kind of quick hack do I do to offer…to get people money?” No. That’s not how it works. The sophisticated investor will look at you as a person, will look at you as your appearance, will look at you and your financial habits, will ask you for, potentially, for your own credit score. Right? When we raise money for our apartment complex, these people asked me, like, “Jack, what happens when you die?” They asked me about follow-up questions. They asked me about, “Well, Jack, what is your own credit score?” Right? It’s almost 800, and I’d be happy to show that to people. They asked me, “What is your debt to income…debt to asset ratio?” It is like, “How much debt do you have, and compared to what your assets are?” Right? They ask you for the…they asked me certain things, kind of, like that. They have asked me that. Luckily, I can provided them with financials and things, and not…Well, I can have provided to financial, but I haven’t signed a non-disclosure agreement of course, but I have provided with financials that show that our debt is very low compared to our asset. Now, you might not be in that situation, so how do you overcome that? The deal obviously knows. So one of the things that you can do is to show people how you operate. You gotta give them a model that allows them to see how they, number one, make money, but number two, how they get their money back. So in the land flipping area, so it’s easy in apartment complex. You show them the fundamentals, you show them the track record of the property, you show them what gaps you see, what improvement areas you can see. You show them a pro forma, you show them that the management team you have on board, you show them [inaudible 00:05:52] your experience in real estate. Lots of people have asked me for my experience in real estate before they came on board with our apartment complexes. And they’ll gladly see that we’ve gone through recessions. We have gone almost unharmed through recessions. We actually made money in the recessions in the big downturn, and so on and so forth. And so that gives them confidence again, that we can perform again. And so bottom line is, they look at these things, but obviously the model plays a role. So, show them a model that gives them a clear path to being paid back. So in the case of the medical equipment company, the path that this gentleman has put together is a very good path, where he literally shows how they have already produced 100 machines, these medical equipment machines, that are already ready to be sold. They just need a certification, which is easy to get. And they have another 400, or 300 that are partially done and in production, and if they can just sell the 100 machines to which they already have a list of companies saying like, “Yup, as soon as you have a certification, give them to me. I am waiting for them.” And so, if they only sell 100 of these machines at a fairly high price, they have all the money they need to pay all the investors back. So on the real estate side, you gotta do the same thing. You’re gonna…If you flip a house, rehab a house, you gotta show them, “Here’s my budget for rehab, here’s what if it happens to go over budget on rehab, here’s the price for the property.” So the worst case scenario in that situation should still be allow you to make your money, and give your…get your return. So that’s why on our apartment complex is that underwrite as a worst case scenario. I do, we do a stress test. We say like, “In the worst case scenario, we want our investors to still make a 15% return per year. Right? That’s how we underwrite. Now, if we put in a reasonable scenario, our investors make much more, but we actually sell our investments on a worst case scenario. It’s kinda a little crazy, it’s a little different than a lot of people do it, but it’s worked very well for us. So the first thing you do is you start flapping your lips. You start talking about what you do. As a matter of fact, you actually, you wanna do that if you’re already doing deals. You wanna join our Land Profit Generator Partner’s program. Right? We put the link into the show notes on how you can get in there, so you can start talking about your successful deals, and in the process, recommend…share the word and recommend other people to come over to our Land Profit Generator program. But in order to raise money, what’s invariably gonna happen, if people ask you like, “What are you doing?” So like, “Well, I started flipping land.” So it’s like, “What is that? Tell me about that.” Well it’s, “Well, we find these properties at $0.05 to $0.25 on the dollar. As a matter of fact, I just found a deal for $50,000 that’s worth $200,000. The problem is, I don’t have 50.” So then it’s like, “What’re you gonna do with it?” Well, it’s like, “Well, right now I’m looking for somebody to lend me $50,000 so I can do the deal, so I can buy the property, and then perhaps can…and then we can go sell it for $150,000. Do you happen to know somebody that wants to double their money in a short time?” And they might say like, “Well, how about me?” Right? They might just come right back to you. It’s like, “Well, how about me?” Because in the deal itself, you right away laid out how extremely likely it is that they’re gonna get their money back. Because if they see that the property is worth 200, and you can get it for 50, it’s a no brainer that you’re gonna get your money back. Right? It’s like, in their mind it’s like, “Well, it’s a quarter market value at the very least. We’re gonna sell it for half of market value, so my money is safe,” is what they’re thinking. So hurdle number one instantly taken, but you gotta flap your lips. You gotta start talking about what you do. And in the process, they’re gonna want to do what we do, so refer them over to us and make an affiliate or a partner commission on the deal and spread the word, and help other people be more financially free. Right? So the second way you do this though, it’s again, you just surround yourself with people who actually are…surround yourself with people who actually are already investors, who actually have an interest in giving money, doing these kind of things. So go to real estate investors association meetings. Like one of our coaches just went to a luncheon of a real estate investors association meeting, and he just talked about what he’s doing. He says like, “I’m looking for money partners.” He had, like, eight business cards afterwards, people totally interested in giving him money, because people are sick and tired of having their money sit in the bank at 1% or 0.25% or 0%. Right? So as a result, just start talking about what you do, and not everyone is gonna be the right fit, but some people will. Right? And then, and then you tell them what? Tell them that you get a first lien position, or the other way is that they become a true money partner in the deal. They buy the property, you sell the property. You found the property, they put the money to buy the property, but they co-own the property, and when you sell it, you split the profits. Right? That’s another way you can do this. So you gotta run through some of the numbers and present them with a model that shows them how they get their money back on the deal. Because at the end of the day, truly, this is more important than the interest rate. So start talking to people, get yourself around people that already do deals, get yourself into…if you can’t afford a country club, I mean, I am not part of a country club. The best investment we have ever done was put our daughter in private school. Right? Because the parents around there, they’re all investment-oriented entrepreneurial parents, and just through conversations, people all of a sudden want to invest with that. We weren’t even looking for investors through that channel. That wasn’t even a thought to us, but all of a sudden, investors coming from the school, and wanting to invest with us, which is obviously awesome, right? And now they’re making great returns, being very happy with their returns, and we have some extra partners on some of these deals too, particularly in the apartment side of things. But, bottom line is, like, people cannot invest with you if they don’t know what you’re doing. And work on your…Keep your integrity intact. If you don’t have the best reputation, fix it. Go start living life into the up and up. Go start doing what you say you do, and saying what you do. Basically, do what you say, and say what you do. Right? So basically, walk a straight line in life, fulfill your promises, don’t be flaky, don’t be promising and then not doing it, and things like that. And instead, do the opposite. Do exactly what you say you will do. Right? Follow up on your promises. Follow up on your commitments. “I don’t feel like it,” doesn’t exist anymore. And soon enough, you’re gonna be known as a stand up guy, and people wanna give stand up guys, or stand up ladies, stand up gal, people wanna give stand up people money. And then again, lastly, surround yourself by success. All right? The people in your bunco or bowling or Sunday afternoon football round might not be the right people to hang out with if they’re broke. Go join a different organization that…where people hang out, that are investment oriented, talk about investment, because you know what? Wealthy people do talk about money. They talk about money. They talk about where they’re investing the stock market, what investment they’ve done, and they invest with each other because they trust each other. All right. Right. With that, thank you very much. Again, as always, if you enjoyed this, give us a five-star review, and leave a little blurb behind there, and then we’ll talk to you soon, And also, if you’re watching this on YouTube, spread the word, share it, put the thumbs up, leave a comment below. We love your comments, and we’ll talk to you soon. Bye-bye. Man: Enjoyed this episode? Then make sure you like, subscribe, and post your comments and questions below the video. We’re looking forward to hearing from you.